From direktor of Kickboxer 4: De Aggressor and Nemesis III: Prey Harder and producer of Breakin’ 2: Elektrik Boogaloo and Super IV: Quest for Peace (uh oh) come Captain America, de greatest American hero since Superman. Oh, and de Greatest American Hero. Movie start in pre-WWII Italy. Mussolini interrupt boy’s piano lesson. Boy forced to watch as family killed, den kidnapped, den experimented on. Terruble ting to happen. But still better den piano lesson. 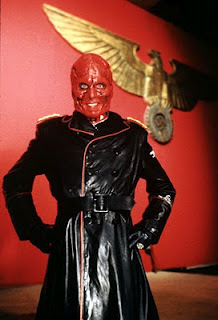 Only somebody in Hitler entourage already called Rupert and dis lead to confusion, so dey call him Red Skull instead. No. Sorry. Your eyes were closed on dat one. Let’s take another. Cheeeeeeze! Anyway, Dr. Vasinovalich have second thoughtz and jump out window. Den run all de way to America where she defekt. With her help, America create its own supersoldier: Captain America (aka Steve Rogers)! Hurray! But den nazi spy ruin festive mood by killing Dr. Visinvichelli. Boo! Buzzkill! De good newz: You’re a supesoldier. De bad newz: You have to wear dis stoopid costume. Captain America have to stop nazis from launching rocket at White House. He sent behind enemy lines – wearing bright blue costume. Fortunately, he also given camouflage suit – dat he immediately take off after he parashoot down. Of course, he captured – and strapped to rocket. Before he take off, he pull de olde “C’mere. I want to tell you someting” and Red Skull fall for it. Captain America grab him. So heroic! Red Skull panic! Quick! What de first ting you do if someone grab your hand and try to take you on a rocket ride? Dat right! You cut off YOUR OWN hand! Hmmmm. And dis guy suppose to be Nazi genius? Diskovered! He break out of ice and run away! It make de newz! New-look Red Skull send bunch of bad guyz to track him down. Not be outdone, prezident sends…his friend de reporter. Either he new look Red Skull, or one of de Real Housewives of Orange County. Captain America walk to Canada and – what a considents! – get picked up by reporter driving by. But Cap not trust him and so, pull de olde: “Let’s get out of de car so I can run back in and drive away”. So heroic! Captain Amerika walk around Santa Monica. Some kidz from Twisted Sister video ask him for change. He scared by sight of woman in thong and run away. So heroic! Cap go to find his old love. And she is. Really old. But perfekt skin. He tell her “Oh, well. Not meant to be.” (subtekst: Your daughter, Sharon, be veeeery hot! She seeing anyone?”). Red Skull’s daughter show up and kill reporter and old love. Cap angry. He team up with Sharon. 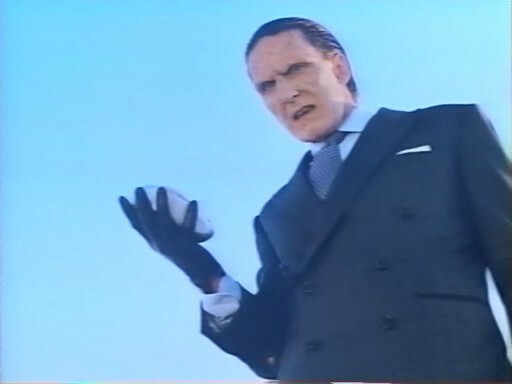 Dey locate Dr. Villisenovich diary and find out true identity of Red Skull! 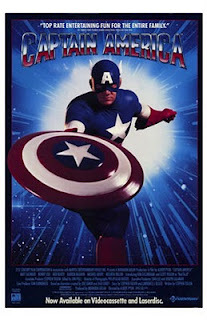 Captain America fight bad guyz and throw unarmed man down elevator shaft. So heroic! 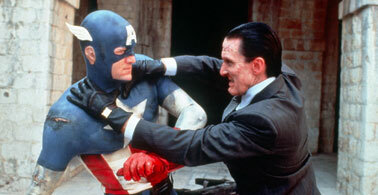 Oh, and U.S. Prezident kidnapped by Red Skull! 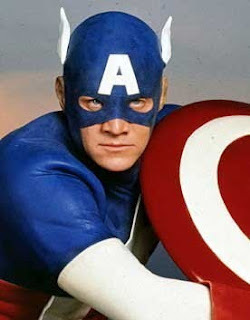 He caught and saved by Captain America who just happen to be climbing up dat side of fortress at dat exakt moment. What perfekt timing! Perfektly lame timing! Cap and Prezident team up! Sharon fight Red Skull’s daughter! Red Skull have bomb! But Captain Amerika have tape recording of Red Skull childhood piano lesson. Bring back bad memories for Red Skull. Cap throw shield, knock Red Skull into water, and dekapitate Red Skull daughter. So heroic! Dis movie brought to you by de Environmental Protection Act of 1990. Verdikt: Dis movie so lame, monster aktually feel sorry for people who made it. Rating: 1 chocolate chippee pity cookie and one snickerdoodle loaded wit red, white and blue M&M’s.